KE, Hao-Ren (2018) Fusion of Library, Archive, Museum, Publisher (LAMP): the NTNU Library Experience. 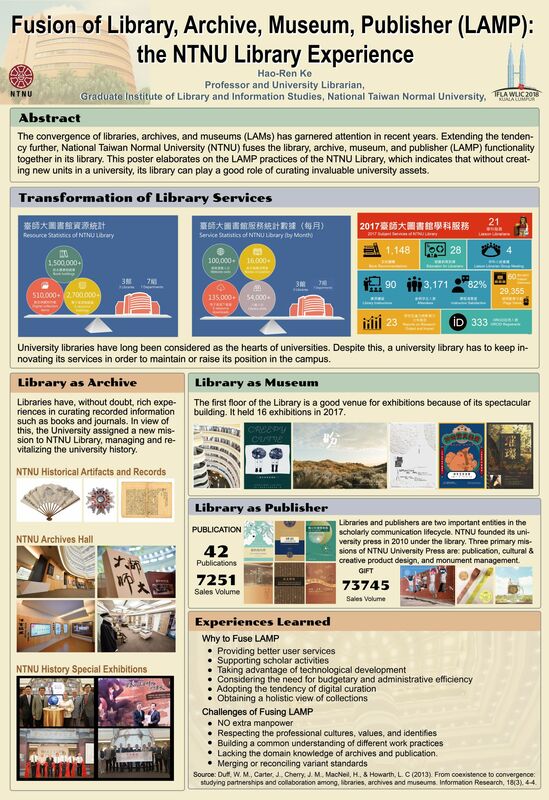 Paper presented at: IFLA WLIC 2018 – Kuala Lumpur, Malaysia – Transform Libraries, Transform Societies in Session 153 - Poster Session. As a prestigious university, National Taiwan Normal University (NTNU) is aware of the importance of the university archive, museum, and university press. However, under the constraints of budget and administrative cost, the University deems that it is infeasible to set up these units separately. Because NTNU Library has excellent performance and expertise in curating recorded information, NTNU decides to fuse LAMPs together in the Library. 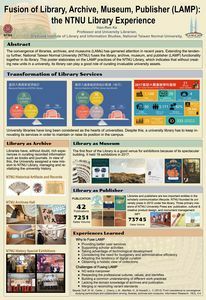 This poster will use photos, charts, and tables to illustrate the activities and achievement of NTNU Library in the fusion of LAMP. For library as archive, NTNU Library appraises and selects valuable historical artifacts and records about the university’s history. It carries out activities to facilitate the access to, and use and reuse of the university history, including NTNU University Digital Archives, NTNU Time Machine, NTNU Wiki, exhibitions, and publications on NTNU history. For library as museum, NTNU Library is a place for cultivating artistic temperament. It held about 25 exhibitions per year. It also participates in the operation of NTNU Art Bank, which loans artworks to organizations and institutions for decoration and exhibition. Finally, NTNU Library administrates the NTNU University Press, the three primary missions of which are publication, cultural & creative product design, and monument management. Valuable experiences in conquering challenges, such as respecting the professional cultures, values, and identifies; building a common understanding of different work practices; and merging or reconciling variant standards for achieving the ultimate LAMP goals, will be shared in the poster.